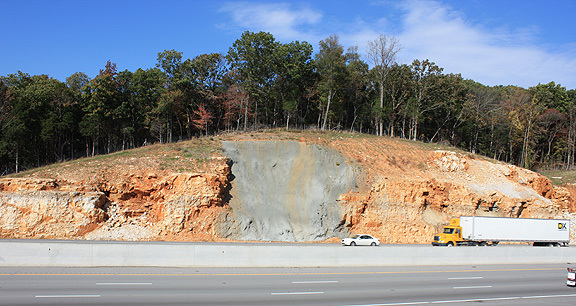 Project obstacles and solutions: During the widening of I-65, a blasting crew found they had opened up a wall to a cavern near Mammoth Cave in Cave City, Kentucky. The opening posed a danger to curiosity seekers, as the cave's terrain dropped an undetermined depth into blackness a few steps into the cave. The Kentucky Transportation Cabinet was overseeing the highway construction and determined the entrance would have to be closed. They needed a fast and permanent solution to the hole. Mick-Murf Construction was selected to fix the hole. They called IMI to supply gunite. Gunite is a dry mix that is mixed with water when it is sprayed at a high velocity onto a surface. The mix had to be carefully blended to prevent any environmental issues, such as seepage into the cave. IMI QC/QA worked with the Kentucky Department of Environmental Protection and KYTC to come up with an acceptable mix design. Mick-Murf was able to seal off the collapsed wall and the construction of the highway was able to proceed.